I love a good roasted turkey, the skin crisp, the flesh juicy. Thanksgiving dinner doesn’t start for me until I have stolen a piece of skin from the bird just out of the oven. For that reason, a dry turkey that flecks off the bone and makes me reach for the gravy boat is just plain depressing. Thankfully, since Danny came into my life, the only reason I have to reach for more gravy is that it’s delicious. Even if it is gluten-free. Did you know that some frozen turkeys can have gluten in them? The turkeys with pre-injected basting might. Seriously? You don’t want those anyway. We put in our order for a free-range turkey, raised locally, never frozen ja few days ago. I can’t wait for that first taste. Of course, there are plenty of you reading who don’t like turkey for Thanksgiving. If not, what are you cooking? Another meat? Or something vegetarian? I’m sure we’d all like to share. This NY Times article about going meat-free for Thanksgiving fascinated me. It seems that many of us avoid turkey during the rest of the year because it’s so darned dry. Well, I’ve learned that turkey has a bad reputation for no reason. 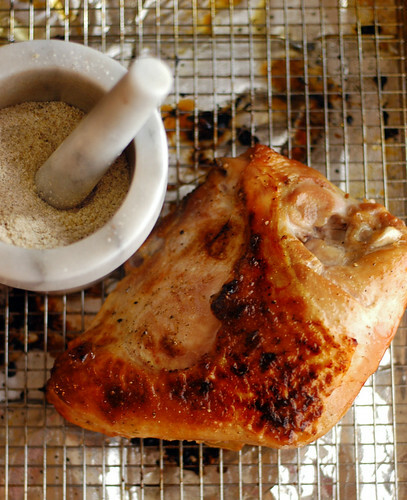 All it takes to make the best turkey you have ever eaten is a little brining. We’ll be making this brine on Wednesday evening and submerging our 12-pound turkey in it overnight. If you are making a bigger turkey, make more brine. Combine all the ingredients and stir well. Last week, Danny and I had the privilege of spending three days in northern California, at Kingsford U. (You can read all about it here, and we hope you do.) We had the privilege of learning from Chris Lilly, pitmaster and champion of barbeque competitions, whose book, Big Bob Gibsons BBQ Book, is now our barbequing bible. In that class, I smelled and tasted and thought and played, until I came up with a spice rub I loved. Chris liked it a lot. Danny thought it was better than his. And we like it so well that this will be the spice rub for our Thanksgiving turkey. We think you might like it too. Combine everything together. Blend well. To make the final turkey, brine it overnight. The next day, pat it dry, as dry as you can. Spread the spice rub, liberally. Put the turkey in a roasting pan. Put it in the oven. Roast at the high heat for 20 minutes. Turn the heat down to 375° and roast the bird until it is golden and juicy, about 1 1/2 hours. You need to take its internal temperature. Most official guides say take it to 180°. We’re seeing a lot of chefs cooking poultry to 175° these days. You should do more reading and see what feels right to you. But please, don’t overcook the bird. Take the turkey out of the oven and let it rest, for about 15 minutes, before carving. This would be the time to make the gravy. Cut into that juicy golden turkey and enjoy. Update: The wonderful Karen Robertson made this suggestion about what to do after brining the turkey. We’re going to try this too. Oh hells yes to this. Thank you Danny and Shauna! I'll be making my heritage bird exactly to your specs – thanks for giving us an easy recipe for a tasty bird. I only cook one every 3-4 years since we usually travel, and I always seem to forget how to get started with the bird business! What vessel do you use to brine your turkey? Does it fit in your refrigerator, or do you have a second regrigerator? I have eaten brined turkeys, and they are always the best. One year, I actually cooked my turkey upside down, with the white meat on the bottom. That was an easy way of softening up the white meat. Another year, I poured white wine all over the turkey, and that helped to tenderize the white meat. Happy Thanksgiving to you, Danny, and Lucy! 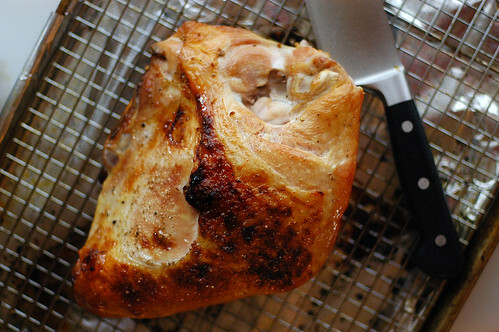 I always cook my turkey white meat down – It is the best! I also have been brining for the last several years, and I have to say, it really, really makes a difference! You will need a container big enough to submerge the turkey. If you have a turkey fryer, consider using that container to brine the turkey. I have one, that I don’t use for anything but that purpose…lol. I would never have known about the gluten injections. OK, I'm gonna have to check my turkey purchase a bit more carefully this year. Thanks for the tip. Oh, and I'm all about the stuffin'. Yea, everything else can pretty much just stay in the kitchen. I have a found pretty good GF one but I'm hoping you'll have a killer one posted soon. Good gracious. That first photo makes me terribly sad that Canadian Thanksgiving has long passed. I might need to get myself a turkey as a salute to those friends south of the border. For a while, back there in the '90s, "free-range," when applied to turkeys, meant "fat-free." After a couple of years of birds that were positively squeaky, I turned to deer. A venison stew is a fine, all-American alternative, and would go beautifully with quinoa. sounds wonderful. Thanks for sharing! Many thanks for sharing your spice rub recipe. I was searching for some turkey inspiration and am going to give it a go. It makes me want Thanksgiving all over again. (I'm Canadian.) I think I'll save this for Christmas, it might be time to try something new. The folks over at Cooks Illustrated (Nov/Dec 2000)suggest letting the bird air dry for a day and here is why…when the bird sits overnight uncovered in the refrigerator (after brining) "the residual moisture left in the skin from brining evaporates during the overnight rest in the refrigerator.The skin crisps in the oven rather than steaming from the excess moisture." If you have time it might be worth a try. We follow this method each year with fantastic results. thanks for the comments. I have to admit, this really is a great-tasting turkey. Sho, we bought giant Cambro containers from restaurant supply stores. Pretty cheap. And they come in handy for everything! Karen, that's such a useful tip! We've never tried it, but I will now. In fact, if you don't mind, I'm going to put your suggestion in the post. Don't you mean the gravy is delicious BECAUSE it is gluten free? That usually means it is made from scratch, not from a mix. And it won't make you feel terrible. I'm actually going to be making duck for Thanksgiving. No, its not the same, but since its just me, myself, and I…. Wonderful. I like to try a different recipe every year. I still remember the one where I used coca cola! Read it in a magazine. I don't drink soda, so i had to buy it special. I have to admit yours sounds better although it really wasn't bad. Perhaps the sugar? How do you make your gravy GF? I am a fan of the sides. Of course that feeling has grown since I began a vegetarian 🙂 Also, the link to the meat-free Thanksgiving New York times article is not working. Though we already celebrated Thanksgiving up here in Canada, after reading your post, I may just have to convince my family to do it again with teh Americans! I love turkey, it's all about the bird for me. Looking forward to turkey sandwiches is enough for me! They're like gold. Though I really like mashed potatoes and gravy (I specifically registered for a gravy boat when I got married for this reason and that my husband thinks it's the most pointless dish ever…little does he know). Allison, as always, I love the way you put this. Jenn, Im sure that heritage bird is going to be fantastic. Be sure to tell us how it turns out. And try Karens trick of letting the bird air dry before you put on the spice rub. Jenny, it is amazing the places where gluten hides! And the gluten-free stuffing to which I linked in the overall Thanksgiving piece is killer, as far as we are concerned. Its what well be eating again this year. Tara, my dear, you could make that turkey even more beautiful. Well raise a drumstick to you! Tamar, as you can imagine, I would love to eat your venison stew. My mouth is watering just thinking of it. You would know how to cook it. And Im pretty sure its closer to the real first Thanksgiving than those overly watered mass-produced birds. Green Acres in the City, oh youre welcome. And what a wonderful blog name! Jennifer, I am wild about the sides and pies too. Oh my goodness, yes. Cheryl, Id eat this turkey any time of the year. In fact, I think I will. Silly to relegate it all to November. Karen, thanks again for the tip! Danny insists well be doing this too. Marisa, good point! Its certainly more delicious for me knowing I can eat it. CatherineMarie, oh dont get me started on duck. We adore the stuff around here. Wed probably have roasted duck with a side of duck confit, if it were up to us. Beastmomma, I would imagine you wouldnt like the turkey too much if you are a vegetarian now! Thanks for the tip about the link. GF Patisserie, youre going to have to hook up with the other Canadians here and have a celebration together! Carrie, Oh, the turkey sandwiches. Hot or cold for you? Me? Its both. i used this recipe tonight when making our turkey tonight. it turned out so well! it tastes AMAZING. thank you so much for doing what you do and making holidays normal for gf girls! Shauna & Danny, thanks again for all of your Thanksgiving recipes – I know you both put in countless hours for us, and I have to tell you that every second was worth it! We made our heritage turkey to your specs, and it was definitely the best bird we've ever eaten – I love how the flavor of the brine was present in every moist bite of meat – and the skin was positively addictive! And, I made my very first gluten-free gravy in 8 years, and it was incredible! I did roast a bunch of veg and aromatics under the turkey to boost the flavor, and everyone around the table agreed that this was the very best gray they'd ever had. But perhaps the sweetest part? I sent my mom your post, and she brined her turkey for the first time, and even though we couldn't be together for the holiday, it was wonderful to feel like we were cooking together – calling and emailing as our birds roasted, and comparing notes after the last of the meat was picked from the bones. Thank you, both! My beautiful man followed your roast turkey recipe & oh, my gosh! It was THE best turkey either of us have ever eaten! Thank you! I usually want something different for Christmas dinner, but this was so good, I asked if we could just repeat it for Christmas! Our Thanksgiving meal this year is the first holiday meal I've cooked since my Celiac diagnosis over 2 years ago. And the biggest surprise – it was the best Thanksgiving meal, really & truly, that I've ever eaten! Everything just turned out beautifully! We had turkey, stuffing (OMG, the stuffing was AMAZING!! '-), mashed potatoes, gravy, garlic snap beans, fruit salad, cranberry sauce, corn muffins, pie & pumpkin bread. What’s up with the picture of the chicken breast? well, it’s a turkey breast. This recipe (brine and spice mix) sounds fantastic! My brother is limited to a ciliacs diet and I am cooking Thanksgiving Dinner this year. Do you know if this will work for ciliacs as well? Also, what do I mix the Brine in? (I’m sorry for the stupid questions) I have used the same recipe for the last several years, but really want my brother to enjoy dinner and not have to cringe at every item. Always such a joy to read your thoughtful, funny, beautifully photographed posts. I used your recipe & it was a hit!!! Fantastic brine!